In 2007 the French government announced the “Grand Paris” initiative. This ambitious project reimagined the Paris region as integrated, balanced, global, sustainable, and prosperous. 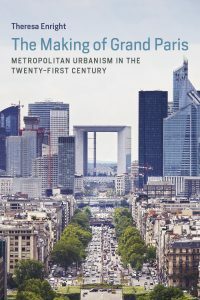 Metropolitan solidarity would unite divided populations; a new transportation system, the Grand Paris Express, would connect the affluent city proper with the low-income suburbs; streamlined institutions would replace fragmented governance structures. Grand Paris is more than a redevelopment plan; it is a new paradigm for urbanism. In this first English-language examination of Grand Paris, Theresa Enright offers a critical analysis of the early stages of the project, considering whether it can achieve its twin goals of economic competitiveness and equality. Enright argues that by orienting the city around growth and marketization, Grand Paris reproduces the social and spatial hierarchies it sets out to address. For example, large expenditures for the Grand Paris Express are made not for the public good but to increase the attractiveness of the region to private investors, setting off a real estate boom, encouraging gentrification, and leaving many residents still unable to get from here to there. Enright describes Grand Paris as an example of what she calls “grand urbanism,” large-scale planning that relies on infrastructural megaprojects to reconfigure urban regions in pursuit of speculative redevelopment. Democracy and equality suffer under processes of grand urbanism. Given the logic of commodification on which Grand Paris is based, these are likely to suffer as the project moves forward.